Options are conditional derivative contracts that allow buyers of the contracts (option holders) to buy or sell a security at a chosen price. Option buyers are charged an amount called a “premium” by the sellers for such a right. Should market prices be unfavorable for option holders, they will let the option expire worthless, thus ensuring the losses are not higher than the premium. In contrast, option sellers (option writers) assume greater risk than the option buyers, which is why they demand this premium. Options are divided into “call” and “put” options. With a call option, the buyer of the contract purchases the right to buy the underlying asset in the future at a predetermined price, called exercise price or strike price. With a put option, the buyer acquires the right to sell the underlying asset in the future at the predetermined price. There are some advantages to trading options. The Chicago Board of Options Exchange (CBOE) is the largest such exchange in the world, offering options on a wide variety of single stocks, ETFs and indexes. Traders can construct option strategies ranging from buying or selling a single option to very complex ones that involve multiple simultaneous option positions. The following are basic option strategies for beginners. Options are leveraged instruments, i.e., they allow traders to amplify the benefit by risking smaller amounts than would otherwise be required if trading the underlying asset itself. A standard option contract on a stock controls 100 shares of the underlying security. Suppose a trader wants to invest $5,000 in Apple (AAPL), trading around $165 per share. With this amount, he or she can purchase 30 shares for $4,950. Suppose then that the price of the stock increases by 10% to $181.50 over the next month. Ignoring any brokerage, commission or transaction fees, the trader’s portfolio will rise to $5,445, leaving the trader with a net dollar return of $495, or 10% on the capital invested. Now, let’s say a call option on the stock with a strike price of $165 that expires about a month from now costs $5.50 per share or $550 per contract. Given the trader’s available investment budget, he or she can buy nine options for a cost of $4,950. Because the option contract controls 100 shares, the trader is effectively making a deal on 900 shares. If the stock price increases 10% to $181.50 at expiration, the option will expire in the money and be worth $16.50 per share ($181.50-$165 strike), or $14,850 on 900 shares. That’s a net dollar return of $9,990, or 200% on the capital invested, a much larger return compared to trading the underlying asset directly. Risk/Reward: The trader’s potential loss from a long call is limited to the premium paid. Potential profit is unlimited, as the option payoff will increase along with the underlying asset price until expiration, and there is theoretically no limit to how high it can go. A put option works the exact opposite way a call option does, with the put option gaining value as the price of the underlying decreases. While short-selling also allows a trader to profit from falling prices, the risk with a short position is unlimited, as there is theoretically no limit on how high a price can rise. With a put option, if the underlying rises past the option’s strike price, the option will simply expire worthlessly. Risk/Reward: Potential loss is limited to the premium paid for the options. The maximum profit from the position is capped since the underlying price cannot drop below zero, but as with a long call option, the put option leverages the trader’s return. A covered call strategy involves buying 100 shares of the underlying asset and selling a call option against those shares. When the trader sells the call, he or she collects the option’s premium, thus lowering the cost basis on the shares and providing some downside protection. 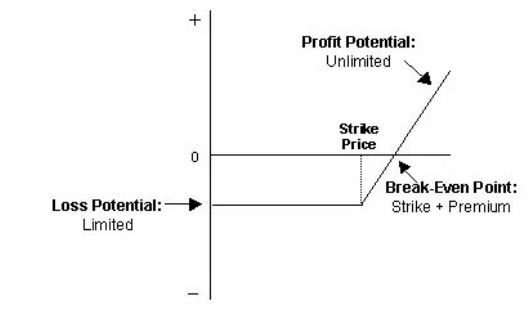 In return, by selling the option, the trader is agreeing to sell shares of the underlying at the option’s strike price, thereby capping the trader’s upside potential. Suppose a trader buys 1,000 shares of BP (BP) at $44 per share and simultaneously writes 10 call options (one contract for every 100 shares) with a strike price of $46 expiring in one month, at a cost of $0.25 per share, or $25 per contract and $250 total for the 10 contracts. 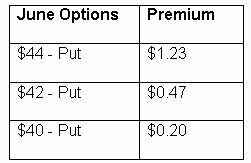 The $0.25 premium reduces the cost basis on the shares to $43.75, so any drop in the underlying down to this point will be offset by the premium received from the option position, thus offering limited downside protection. If the share price rises above $46 before expiration, the short call option will be exercised (or “called away”), meaning the trader will have to deliver the stock at the option’s strike price. In this case, the trader will make a profit of $2.25 per share ($46 strike price – $43.75 cost basis). However, this example implies the trader does not expect BP to move above $46 or significantly below $44 over the next month. As long as the shares do not rise above $46 and get called away before the options expire, the trader will keep the premium free and clear and can continue selling calls against the shares if he or she chooses. Risk/Reward: If the share price rises above the strike price before expiration, the short call option can be exercised and the trader will have to deliver shares of the underlying at the option’s strike price, even if it is below the market price. In exchange for this risk, a covered call strategy provides limited downside protection in the form of premium received when selling the call option. A protective put is a long put, like the strategy we discussed above; however, the goal, as the name implies, is downside protection versus attempting to profit from a downside move. If a trader owns shares that he or she is bullish on in the long run but wants to protect against a decline in the short run, they may purchase a protective put. 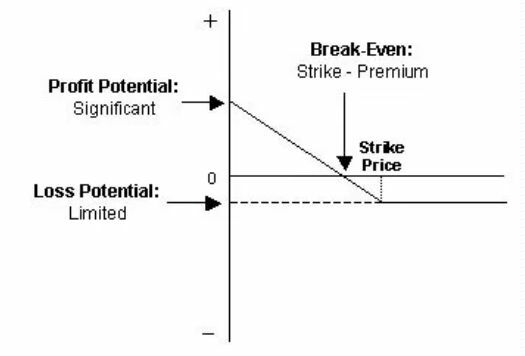 If the price of the underlying increases and is above the put’s strike price at maturity, the option expires worthless and the trader loses the premium but still has the benefit of the increased underlying price. On the other hand, if the underlying price decreases, the trader’s portfolio position loses value, but this loss is largely covered by the gain from the put option position. Hence, the position can effectively be thought of as an insurance strategy. The table shows that the cost of protection increases with the level thereof. For example, if the trader wants to protect the investment against any drop in price, he or she can buy 10 at-the-money put options at a strike price of $44 for $1.23 per share, or $123 per contract, for a total cost of $1,230. However, if the trader is willing to tolerate some level of downside risk, he or she can choose less costly out-of-the-money options such as a $40 put. In this case, the cost of the option position will be much lower at only $200. Risk/Reward: If the price of the underlying stays the same or rises, the potential loss will be limited to the option premium, which is paid as insurance. 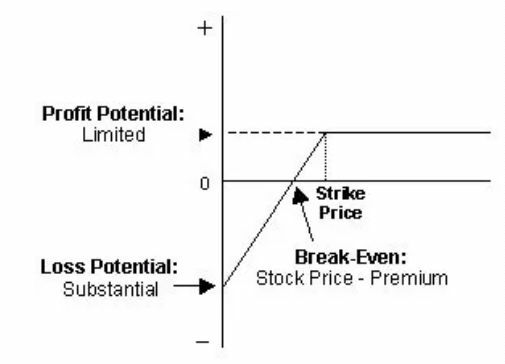 If, however, the price of the underlying drops, the loss in capital will be offset by an increase in the option’s price and is limited to the difference between the initial stock price and strike price plus the premium paid for the option. In the example above, at the strike price of $40, the loss is limited to $4.20 per share ($44 – $40 + $0.20). Covered call strategy or buy-write strategy: Stocks are bought, and the investor sells call options on the same stock. The number of shares you bought should be identical to the number of call options contracts you sold. Married Put Strategy: After buying a stock, the investor buys put options for an equivalent number of shares. The married put works like an insurance policy against short-term losses call options with a specific strike price. At the same time, you’ll sell the same number of call options at a higher strike price. Protective Collar Strategy: An investor buys an out-of-the-money put option, while at the same time writing an out-of-the-money call option for the same stock. Long Straddle Strategy: Investor buys a call option and a put option at the same time. Both options should have the same strike price and expiration date. Long Strangle Strategy: Investor buys an out-of-the-money call option and a put option at the same time. They have the same expiration date but they have different strike prices. The put strike price should be below the call strike price. Options offer alternative strategies for investors to profit from trading underlying securities. There’s a variety of strategies involving different combinations of options, underlying assets, and other derivatives. Basic strategies for beginners include buying calls, buying puts, selling covered calls and buying protective puts. There are advantages to trading options rather than underlying assets, such as downside protection and leveraged returns, but there are also disadvantages like the requirement for upfront premium payment. Elvin Mirzayev is Head of Investment at GrowthTrend Partners LP in Baku, Azerbaijan where he was also formerly a Senior Investment Analyst. He is also a CFA Chartholder from the CFA Institute as well as a certified FRM from Global Association of Risk Professionals. PrevPrevHow Does Google Make Money?